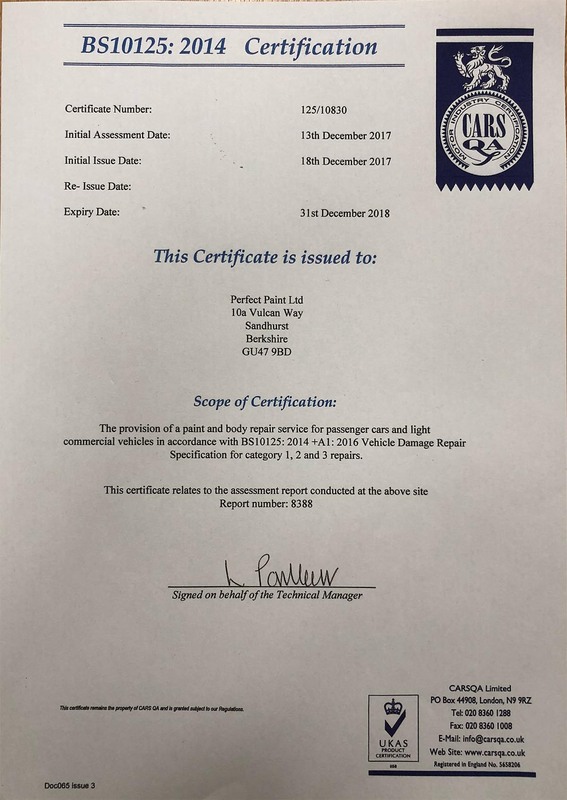 Established in 1991, Perfect Paint has drawn on its many years of industry experience to become one of Berkshire’s leading body accident repair centres. From Porsches to Peugeots, Ferraris to Fords, minor scratches to complete body overhauls, our expertise will guarantee you a first class finish to all damaged vehicles that enter our MVRA approved workshop. We know that being without your vehicle is an inconvenience, which is why we offer a hassle free service, completing every repair as quickly as possible whilst ensuring outstanding quality. We are BS10125 accredited meaning you can be rest assured that your vehicle will be restored to showroom condition. Don’t allow your insurance company to dictate your repairer! If you’re making an insurance claim, it is your legal right to choose your own preferred garage to carry out the repairs. Before each car is released, it will be valeted with a final check done by our experienced team, ensuring you will be happy with the final repair. And just to make life easier for our customers, we also provide courtesy cars.